Major League ballpark food has gone way beyond peanuts, Cracker Jacks, and the all-American hot dog. Now you can enjoy full meals, international cuisine, and eye-popping, gut-busting specialty dishes concocted for maximum publicity. 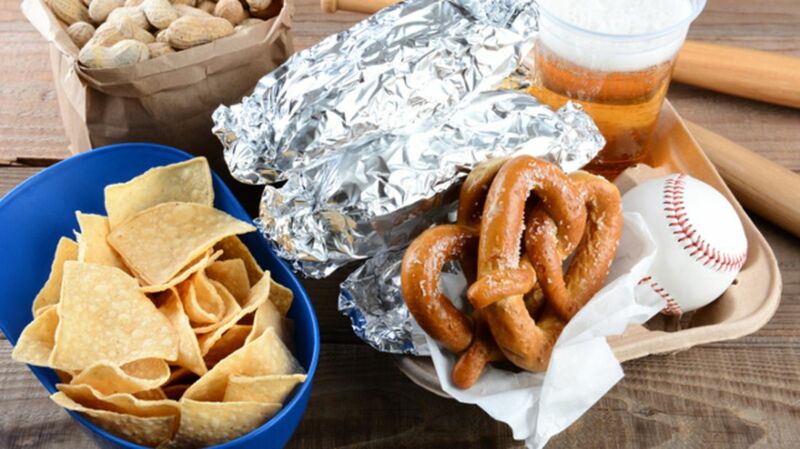 Let's sample some of the outrageous dishes available at baseball games this year. Wayback Burger has the ultimate meat-lover's burger at Citizens Bank Park in Philadelphia. Watch the Phillies while eating a Triple Triple Burger with nine beef patties and nine slices of cheese. And some veggies, if you can find them. First seen in 2015, Pig Guy still offers S‘mores Bacon on a Stick at Citi Field. That's a slice of thick bacon dipped in marshmallow, chocolate, and graham cracker crumbs …on a stick. If you so choose, there are other toppings available for your bacon on a stick, like Sriracha maple glaze or salted caramel. Served by Edgar's Cantina, the authentic Oaxacan chapulines debuting this year at Safeco Field in Seattle are "toasted grasshoppers with chile-lime salt seasoning." [PDF] They sold out on opening day, and the ballpark moved more grasshoppers in three games than Edgar's home restaurant Poquitos serves in a year! Not in the mood for toasted grasshoppers? There are plenty of sweet treats available at Safeco Field in Seattle, including the made-to-order deluxe frozen custard cookie sandwiches from Frozen Rope Sandwich Company. As you can see, they come with extras. In case you don't know what Rocky Mountain oysters are, they're bull testicles that are sliced and deep-fried. Not only are they a huge hit throughout Colorado, they've been a staple at Rockies games for 20 years. New for 2017, you'll be able to try the Texas Snowballs at Globe Life Park in Arlington, Texas. It's made of chopped brisket and barbecue sauce rolled into a ball and covered with funnel cake batter. It is then deep-fried and sprinkled with powdered sugar. Is it an entree or a dessert? That's your decision. Choomongous is both a sandwich and a description. This staple at Globe Life Park in Arlington, Texas, is a 24-inch Korean beef sandwich that was crafted in 2014 in honor of Texas Ranger outfielder Shin-Soo Choo. The sandwich is stuffed with Korean-spiced beef, spicy slaw, and Sriracha-infused mayo. Your best advice is to split it with a friend or two. Watch baseball at Minute Maid Park and use only one hand to eat a full dinner. The Chicken and Waffle Cone puts fried chicken fingers and mashed potatoes inside a large waffle cone with honey-mustard sauce on top. The fan favorite is in its third year of satisfying hungry Astros fans. Miller Park in Milwaukee is the home of Inside the Park Nachos, which is basically taco meat on a stick that is rolled in crushed Doritos, fried, and served with cheese sauce, sour cream, and salsa. Chase Field in Phoenix first served the Churro Dog in 2015. This is not the ballpark hot dog you're used to, but an 1100-calorie dessert. The "dog" is a cinnamon churro, the "bun" is a split Long John donut, and the toppings are frozen yogurt, chocolate sauce, caramel sauce, and whipped cream. For 2017, the Churro Dog 2.0 comes dressed up in Oreos! The churro is rolled in crushed Oreo cookies, strawberry topping replaces the caramel, and then a generous helping of more Oreo crumbs is sprinkled on top. Target Field is offering a new Bloody Mary during Twins games. Hrbek's Pub supplies the new Triple Sausage Bloody Mary, a Bloody Mary with deluxe garnishes including three varieties of sausage (brat, Polish, and andouille), in addition to cheese cubes, peppers, and various fruits and vegetables. You can get a variation with a hamburger garnish if you like!